Drilling access holes through concrete, wood and sheet metal, with the PKI 7545 breaching system makes searching sealed voids becomes quick and easy. The Breaching System is the fastest method available to positively locate victims of structural collapse. Its operation is facilitated by compact, comfortable support handles and a convenient throttle control and thumb operated safety switch. Four heavy duty various bits are provided with each system. The high speed diamond bits are water cooled by attaching the pressurized water container to the provided coupling. Coring in standard construction concrete averages 8 cm per minute. 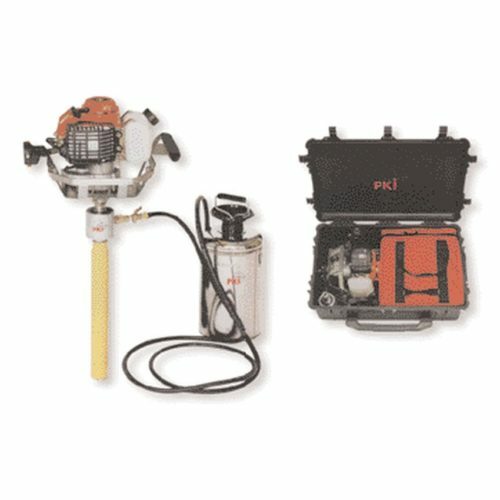 The PKI Breaching System doesn’t need an electrical generator or air compressors. The system is fully portable and saves precious time when life is in danger.